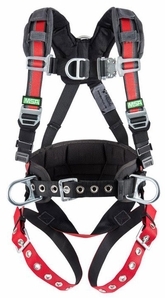 MSA�s new EVOTECH 10112741 Construction Harness offers the latest design features that improve user comfort, ease of use, durability, and user safety and other features of the EVOTECH harness with the added functionality of an integral back pad with tool belt. The EVOTECH Construction harness has Nanosphere� coating on the webbing that repels grease, dirt & moisture. NanoSphere� coating on webbing repels dirt, grease, moisture, etc.